We all know how healthy nuts and seeds can be, but I used to cringe at them growing up. I wasn’t fond of the waxy, slightly bitter taste or the bland texture. My parents often put out a bowl of trail mix… I would always eat the M&M’s and dried fruits instead of the nuts. When I did force myself to eat a handful or two, I didn’t like how I felt afterwards… my stomach would sometimes feel heavy & aching. My head would hurt. My mouth sometimes felt funny and I often got tired & cranky. Now, I can digest and throughly enjoy nuts with no problems! Allow me to share with you, as part of our 21 steps to a nourishing diet series, what I learned about nuts & seeds and touch on three of the ten reasons why properly preparing them is vital. Did you know that raw nuts and seeds have defense mechanisms made up of enzyme inhibitors, toxic substances (tannic acid & goitrogens) and phytic acid? Yep, these natural components are there for their protection. Nature doesn’t want the seed to germinate prematurely or predators to consume them to the point where they become extinct. It is amazing how God designed nuts & seeds to have these defense mechanisms so they can continue to bring forth new plants for many, many years! Those natural components can be removed naturally only when there is enough moisture to sustain a new plant after the nut or seed germinates. WHAT’S THE BIG DEAL ABOUT PHYTIC ACID, GOITROGENS & ENZYME INHIBITORS? The biggest defense mechanism in nuts & seeds is the phytic acid. Every nut & seed have different levels of phytic acid with almonds, brazil nuts and sesame seeds having the highest percentage. When something that contains phytic acid is eaten, the acid binds itself to minerals like iron, magnesium, zinc, calcium, manganese and chromium in the gut, which prevents the digestive system’s ability to break the nut or seed or grain down properly (that’s why, often, when you eat nuts or seeds… you see undigested bits in your stool the very next day!). If you struggle with anemia, low zinc levels, osteoporosis and other illness related to low mineral absorption… you should not be eating unsoaked nuts, especially walnuts, almonds & peanuts. Recently, my grandfather was admitted into the hospital for extremely low hemoglobin. One habit my grandfather has, that I believe is one of the causes of his low hemoglobin & other health issues, is he eats several handfuls of raw/roasted nuts & seeds every day and has done so for years. He believes they are good sources of protein and energy, but they are really causing him more health issues and stealing away his lifespan & energy. For him and everyone else, soaking will help break down the phytic acid and increase the nutritional value without taking away vital nutrients needed for him to be healthy in his old age. Even though phytic acid is the big, bad guy in nuts and seeds… goitrogens & enzyme inhibitors should not be overlooked either. Goitrogens is are known to suppress the function of the thyroid gland by interfering with iodine uptake, which can cause a goiter (enlargement of the thyroid), slow down the thyroid, hypothyroidism and other autoimmune thread disorders. Soaking helps reduces goitrogens and actually increases the necessary minerals needed for a healthy thyroid! Enzyme inhibitors neutralizes vital enzymes that your body naturally produces and can lead to many illnesses that results of an unhealthy, enzyme-depleted gut. Signs that your body is lacking enzymes are bloating, constipation, diarrhea, heartburn, irritable bowels and gas. A lack of just one enzyme in the body can lead to many problems and you will only live as long as your body has enzymes… which is why it is important to neutralize the enzyme inhibitors to keep them from decreasing your body of its natural enzymes. Soaking increases the natural enzymes within the nuts & seeds, helps provide greater absorption of the its’ nutrients and increases digestibility. Basically, when you eat raw nuts or seeds or grains that have not be properly prepared… those “healthy” morsels are actually robbing you of vital minerals, vitamins and enzymes needed to sustain a healthy body! I feel we should respect those defense mechanism by properly soaking nuts and seeds before consuming them. All you need to do is mimic nature’s germination system and give those nuts & seeds a good soak to deactivate the phytic acid, giotrogens and enzyme inhibitors! 1. Add your nuts/seeds to a glass jar or bowl and mix warm water & sea salt (make sure there’s enough water to cover the nuts completely). Soak them for the time required. 2. When done soaking, drain out the soak water and thoroughly rinse the nuts. 3. You can do one of two things: refrigerate the soaked nuts and consume within 24 hours OR dry in a dehydrator (or in oven set on the lowest temperature). Store in an airtight container. Important note: The soak water should always be discarded and never used as water in a recipe or given to your animals. Soaking & dehydrating nuts and seeds was one of the first things I learned to do after reading Nourishing Traditions and we decided to start up the path of preparing our food more traditionally to improve our overall health. I wanted to see if it would really make a difference and if I could tolerate nuts after being soaked & dehydrated. Honestly, I was a little skeptical. It was my very first bite that won me over. My first bite of an almond right out of the dehydrator was deliciously sweet & crunchy. I grabbed another and another and another and soon I was sitting at my kitchen table with a bowlful of warm, sweet, crunchy almonds. After indulging, I got nervous that I was going to have my usual reactions even though I normally start feeling them almost right away. 20 minutes passed… felt great. 30 minutes passed… felt great and energetic. An 1 hour passed and I still felt great! I was thrilled! Of course, I ordered some walnuts and pecans to try next. These were my least favorite nuts, but after taking them through the 3 simple steps… I was won over by their wonderful buttery taste and crunchy texture. That is one of the many reasons why I am still faithfully soaking and dehydrating our nuts and seeds over 7 years later! It has become a normal routine where I would buy nuts & seeds in bulk once a month and follow my 3 simple steps. All that prep takes me less than 10 minutes! I can say that it has made a difference to our overall health and my kids do not like to eat nuts or seeds that have not be properly prepared. They know the difference between raw & un-soaked nuts to raw & soaked nuts by their flavor, texture and how they feel after eating them. 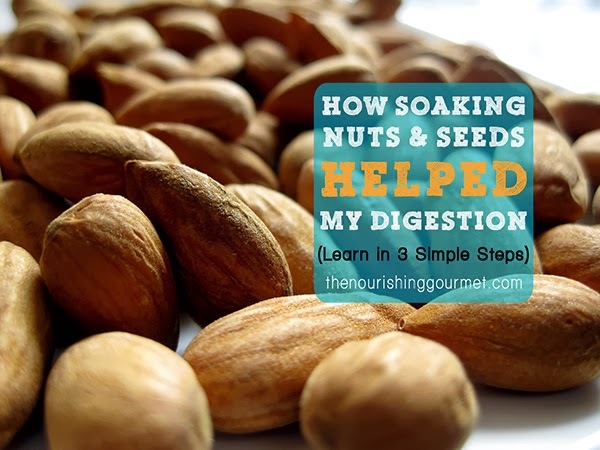 Think you are ready to take on the easy challenge of soaking your nuts and seeds?? Your gut will profusely thank you if you did! All you need to do is mimic nature's germination system and give those nuts & seeds a good soak to deactivate the phytic acid, giotrogens and enzyme inhibitors! Add your nuts or seeds to a glass jar or bowl and mix in warm water & sea salt (make sure there's enough water to cover the nuts completely). Soak them for the time required. When done soaking, drain out the soak water and thoroughly rinse the nuts. You can do one of two things: refrigerate the soaked nuts and consume within 24 hours OR dry in a dehydrator (or in oven set on the lowest temperature). Store in an airtight container. Unfortunately, even soaked nuts don’t always agree with me, but then I don’t have a gallbladder so that could make the difference. Sad. 🙁 Can you handle seeds at all? OH, that is sad. I have heard that not having the gallbladder can make it more difficult to digest nuts. That happened to a friend of mine a few years back. She was so disappointed, but she did say she can handle some seeds. Maybe give that a try? Do the nuts have to be raw before soaking? If the nuts aren’t raw, they won’t have any enzymes left, which is problematic to the soaking process. Also, phytase, which is needed to reduce phytic acid levels, is heat sensitive, so nuts that aren’t raw won’t contain it, rendering the soaking process ineffective for phytic acid reduction. So I would definitely say use raw nuts! Hello Cindy! Yes, nuts need to be raw because of what Kimi already shared with you, but I also wanted to add in that I experimented one time several years back to see what happens if you try to soak roasted nuts… basically, the nuts got really mushy and smelled pretty gross after being soaked overnight. That told me that there were no live enzymes in the nuts because it was cooked. Hope that brought more understanding to why nuts need to be raw to soak properly! LOVED this post Marillyn, thank you for sharing it. I’ll be pinning it and sharing on my FB page!! I’ve been meaning to get back to soaking sunflower seeds for weeks, and after reading this post I finally started some. I’ll probably take mine all the way to the small sprout stage for eating on salads. Anyone have any other ideas for using soaked/sprouted sunflower seeds that don’t involve dehydrating and baking with them? I know if a process has too many steps I just won’t keep up with it. Those are all helpful ideas, thanks! I’ll have to try them in fruit salads next. OH! Forgot one thing that I often like to use my sunflower seeds in… broccoli salad! So good! Can I make other recipes – for example, nut butter- with nuts that have been soaked but not yet dehydrated? Hello Liz, I can’t really answer your question because I always make my nut butters after soaking AND dehydrating my nuts. I would thing you could do it, but it will have a different texture and probably a shorter shelf life in the fridge because of the moisture. The moisture can affect the final results, but you won’t know until you try it! Let me know if you do and what you think, Liz! I thought I’d chime in for a moment as well, I was just talking with a friend about this yesterday. A few years ago I tried to make peanut butter from peanuts that had been soaked but not dehydrated and it did not turn out well. It was a watery, gloppy mess that I ended up having to toss. I think part of it might be due to the fact that water and oils don’t mix. I would assume this would be true with other nuts as well. Hey Katie! Thanks for sharing your experience. I was wondering about that myself because of the natural extract of the oil when blending for a long period of time. I had prepare Almond nuts by soaking overnight, rinse and then leave them out to dry naturally for 2 days or so (I’ve checked and make sure they are completely dry) but my Bosch 1250 watts food processor and Vitamix Prep 3 failed to pulverized the soaked Almond nuts into nut butter. I don’t have an oven nor a dehydrator. Even If I do want those, it’s space constraint problem. So I tried again by doing an additional step. I pan-fry them at low heat for several minutes or until I smell something or notice the natural oils coming out. After I cool them down… my food processor and Vitamix still failed at pulverizing them into creamy Almond butter. A friend told me that the Almonds already absorbed the water, like Katie mentioned, obviously water and oil don’t mix. But I had them completely dry out. So, what gives ? Also, why must add Salt ? What if someone can’t talk too much salt in their diet but they want soaked Almonds ? Is it necessary to use salt ? Salt is unhealthy to some people. Since the Almonds will absorb the salty water, it won’t be good for those who can’t eat salty Almonds. But if we use clean filtered water to soak the Almonds, would it be suffice ? I’m sorry for the delay of responding to your questions, but better late than never. In regarding making butter from the nuts you’ve soaked and air dried. Unfortunately, the nuts need to be completely dried to the core. Air drying for two days is not enough. The texture of the nuts have to be very crunchy with a dry texture. I often dry my nuts anywhere from 24 hours to 4 days in the dehydrator to insure that they are completely dried. Air drying would take much longer and is recommend to put the nuts in the sun to help the nuts dry fully. Often nuts are dried to the point where they are soft and crunchy with moisture. That’s not dried enough to make butter. Every week I make a jar of almond butter using my soaked and dehydrated almonds with no issues. I use a very nice food processor. No oils. Regarding the salt. I agree with you that too much salt is not good… For anybody. That’s why I shared in the post to use sea salt (Real Salt or Pink Himalayan salt is what I use), not plain white refined salt. The minerals from sea salt is actually very healthy for everyone. People on low salt diet will experience other health issues because the body needs good salt and minerals to thrive along with other healthy foods. Soaking with just water will not be enough to break down everything properly. I hope all this was helpful! Hello Jacky, there is a link for you to click on in step #1 at the end… ‘soak them for the time required’, but I will post the link here for you too. Did you mean to say that you already roasted your walnuts in the oven? If you did, then no you can’t soak them because the live enzymes will not be there and the nuts will get mushy. Like Jacky, in the last comment, I, too, am wondering how long to soak the various nuts. Also, I have heard in the past that the water needs to contain some acidic substances, like kefir, kombucha, vinegar, etc, to effectively break down the phytic acid. Do you know anything about that practice? Thank you. With nuts and seeds… it is salt that is used to help activate the enzymes to break down the enzyme inhibitors and phytic acid. During the soaking process, the natural components are released into the water… which is why rinsing the nuts is important to completely remove them. When you click on the link… the article will talk about why using salt instead of an acid substance is used to soak the nuts and seeds. Thanks for such wonderful information, Marillyn! This may seem like a silly question, but I was wondering… when you buy raw sliced almonds or even almond meal, should you be doing the same thing? Is it even possible? I buy sliced almonds and am able to soak and dehydrate them with great success. They are wonderfully crunchy and great in oatmeal and other things. I don’t own a dehydrator so can you tell me how long to dry the out in the oven please? Hello Beverly, you will need to set your oven at the lowest temperature and let them dry out until dry and crunchy. I can’t tell you how long that will be because the oven is a different set up without the dry air blowing like in a dehydrator. I would soak the nuts overnight and then put it in the oven first thing in the morning, then check it every hour or so (stir the nuts too) until they are done so you know exactly when they will be done in your oven. hi there, I found the link for how long to soak the nuts for but didn’t see any info on seeds, I use chia and hemp seeds alot and was wondering if they needed to be soaked and if so for how long, also how much salt do you usually add to the water?? With the salt, I usually use 1-2 Tbsp for every 2-3 lbs of nuts and seeds for soaking. Really, to make things easy for me… I just simply soak my nuts and seeds overnight and dry them sometime the next day. I have left my nuts and seeds in water for 24 hours before and they were fine. Just need to be sure to rinse very well. With the salt, I usually use 1-2 Tbsp for every 2-3 lbs of nuts and seeds for soaking. The only nut I don’t soak for that long is cashews… they should only be soaked for 2-4 hours. I have few doubts regarding this soaking and dehydration process. I will list them down one by one. 1) What are the maximum and minimum times to soak almonds ? What are the effects if we cross those timings ? 2) Can’t we dehydrate nuts without oven, I mean if we keep them in a box or in a dry place ? 3) Is this dehydration stage necessary ? what are the effects if we don’t dehydrate after soaking them ? 1) Minimum – overnight or 12 hours. Maximum – 24 hours. I’m not understanding your second question. 2) They will mold, unless you live in a very hot, dry place like Arizona. They need to be dried in direct heat (oven, dehydrator or sun) preserve the flavor of the nuts, otherwise they will develop an off flavor. 3) The dehydration stage help preserve the nuts to last a long time, otherwise they will go bad quickly. The nuts need to be throughly dried to preserve it. Yes, I have soaked and dehydrated sliced almonds with great success! Soaking: I tried soaking Flaxseed and it was a slimy mess. You said do not soak Chia seeds and I assume the same for Flaxseeds. Do you have a list of nuts and seeds not to soak? I’m surprised I didn’t also include flaxseed with the chia seeds. Yes, it is unnecessary to soak them as they get slimy and impossible. They do contain very small amounts of phytic acid and others, but there is no need to worry unless you are consuming large amounts of them. Moderation is key. As for a list of seeds and nuts NOT to soak, it’s pretty straightforward… Anything that can turn to gel or mush shouldn’t be soaked because drying them will be impossible. I actually soaked my flax seeds in Celtic sea salt.I dried them in a low temp oven for about 24 hours and they worked out.This is fine,correct?I just prefer it. Does this work with Cashew nuts as i understand that they have to be roasted to get rid of the phenolic resin & anacardic acid so I suppose you can’t really get them raw? Yes, but you only need to soak cashews for about 4 to 6 hours. Otherwise they develop an off flavor. I did that once, soaking too long, and it wasn’t very good. I forgot to add can you consume the nuts straight after soaking without dehydrating? Does things like peanut butter still contain the phytic acid? Yes, you can eat nuts after soaking, but they turn very quickly even in the fridge. Drying them makes them last longer (up to a year). Yes, peanut butter do contain phytic acid and in higher quantity. If I am eating Brazil nuts for the selenium, does the phytic acid bind the selenium so I am not able to digest and absorb it unless soaked? So if one brazil nut has 95.8 mcg of selenium, am I getting any of it? Some say that Brazil nuts cannot be soaked because they are so high in fat, the water doesn’t penetrate them. So is there then any benefit to eating Brazil nuts for the selenium? I’m confused. I just recently read that Macadamia nuts, brazil nuts & hazelnuts do not need to be soaked as they have very low phytic acid. Good news and good timing! oh and yes, you are still getting the benefits of eating brazil nuts! After dehydrating, what is the shelf life of the nuts and how to store? Also, do you buy them in-shell? They need to be stored in an air tight container and in a cool area (your pantry is a good place). Walnuts are best stored in the fridge or a very cool area because of the oils. I do not buy them in-shell. Oh, almost forgot! You can store the nuts for up to a year in an air tight container. use them in my nutri bullet for a green drink. Will that do the trick vs. the oven? I do not have a dehydrater. Hello Khi! You can air dry them, but they need to be completely dried to store them long term. Pumpkin seeds are thinner, so that helps. With other nuts it would not work well. Oven drying at the lowest temperature is the best route to make sure the nuts drying throughly and completely. I have a doubt, should I soak everyday almonds or once a large amount & last it for a week. I soak an entire bowl at once (probably 4 cups or more), dehydrate and store in the fridge. That lasts me for weeks. What other dry fruits can we soak in water? Yes you can soak walnuts and pistachios. Pimples and red flush on the face is a sign of digestive distress. It would be good enough to soak the nuts for 12 hours (through the night) in your warm weather. After soaking the almonds for say 12 hours, do I have to peel the skin off too or its okay to keep the skin if you soak them? Also, I plan to eat them right away water soaking, I don’t plan to store them. Lot of information on the internet is confusing at times because no one tells if you should peel them even after soaking. Some say the skin has vitamin D so you keep it. Kindly reply and end my silly confusion ???? You do not have to peel the skin. Some like to peel the skin for easier digestion. Is it necessary for soaking it 12 hrs? Will it destroy the flavor of the nuts? Yes, it is necessary. If you read through the article, I shared that the flavor actually improved and tasted much better after soaking and dehydrating the nuts. Everyone that I’ve shared my soaked and dried nuts ALWAYS noticed a difference in flavor and how much BETTER they tasted compared to unsoaked nuts. Store bought nuts roasted with sea salt do NOT have the same digestive benefits as soaking and dehydrating nuts at home. Plus, soaked and dried nuts are not “cooked” like roasted nuts are and have higher nutritional value. Great informative article. I put all my nuts, seeds, and coconut flakes together in a jar in the fridge. Every night I soak everything together including quick oats. The next morning I just add fresh or frozen fruit and a squeeze of lemon and eat it for breakfast. I had no idea that I was supposed to add salt and drye them. So I guess I have been eating them with the soaked water that I’m suppose to discard! When drying them, will the heat from the oven remove some of the nutritional valeu? What about storing them all together in a jar in the fridge? Will it keep them fresh longer? Thank you very much. Yes, you always want to discard the water after soaking grains and nuts. You can eat the nuts without drying them, but they will keep longer, taste great and have a nice crunch when you dry them. If you use the oven… keep it at the lowest temp possible. 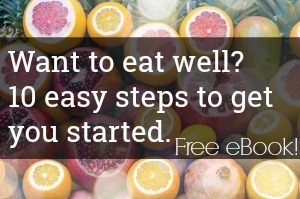 A dehydrator is preferable to keep in as much of the nutritional value. You can store them in a cool, dry place or in the fridge, but make sure they are sealed well in the jar to prevent moisture from getting in. This is a very late post but I am on my journey to soaking nuts because I eat so much everyday! I just did walnuts and almonds in different containers with warm water and pink sea salt. Do I store the nuts in water in the fridge and leave over night or on the counter? Leave them out on the counter over night! Can we avoid drying the seeds after soaking if they are to be consumed immediately? Or does the drying process removes some more phytic acid after soaking? Can we dry roast the seeds in a pan instead of microwave after soaking? Thanks for sharing the information, nuts are always good for health. I was scrolling through all the posts to see if there was a question about using an Instant Pot to soak nuts. I read on another blog that this could be done, but there were no instructions. So, now I’m on the hunt for the “how to”, since I can’t tell you how many times I go to bed and forget to soak my almonds, etc. Anyway, have you, or any of your readers, heard of this? If so, can you please share? Thanks so much! Is it possible to freeze the nuts after the soaking process? If so, how does that work, do I have to put them through the dehydration process or can I just rinse and dry them and then throw them in a zip lock bag before placing them in the freezer? Also, how long would they store for? Another question, when you dehydrate them and put them in a jar, how long are they good for?